I'm glad you were there for your family at the end of your loved one's life and sad for your loss. 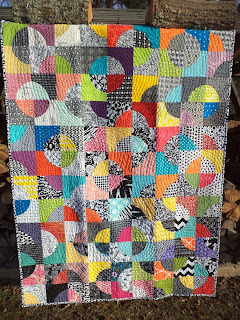 Thanks for taking the time to share those wonderful past projects. 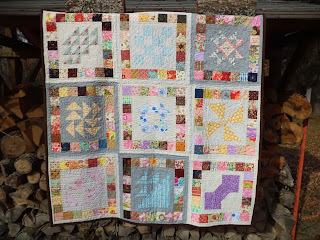 They are all SEW lovely!! Kat, it sounds like quite an exhausting but rewarding experience overall. I am so sorry for your loss. Even as you helped therapeutically and with your medical experience, It's good to know that you're processing for yourself as well. 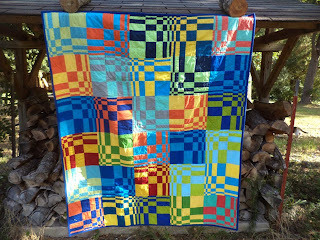 I adore those quilts that you just showed, but it is your words that really resonate. Death is inevitable and yet we don't want to talk or think about it until it's necessary. Thank you for reminding us of the valuable lessons in learning and thinking over key issues ahead of time. Thank you for sharing that. It is something we should all be mindful of and as prepared as possible. My condolences on the loss of Mr. Hubler. He sounds like an amazing person, gone much too soon. Thank you for sharing some of your thoughts on this complex and difficult subject, and for the links to further reading. It's something I've been trying to educate myself about for years. My mother is very open to the hard conversations, my father much less so, and my stepmother? Forget about it! 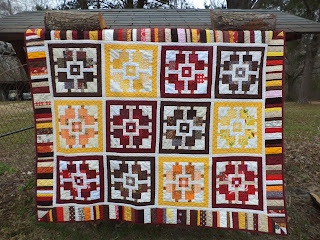 Forgot to say: Your gallery of older quilts is lovely! 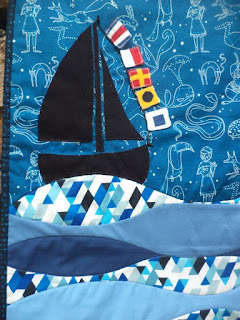 You know my favorite is the nautical baby wall hanging :) Is that the baby's name spelled out in signal flags? I could go translate it, but I'm feeling lazy. It's wonderful that you were able to be there for your family. I appreciate your sharing your thoughts about how we handle end of life issues in our country. There is so much we have to process when faced with death, we have been conditioned to ignore it until the very end. Thank you for the links. It's helpful to be able to read about some of the issues we all have to deal with. My mother was on Hospice for 3 years with the same staff..it was truly wonderful..Because she almost died 4 times before she fell out of her wheelchair and broke her neck on the way to lunchbunch...She was able to go to her own wake. 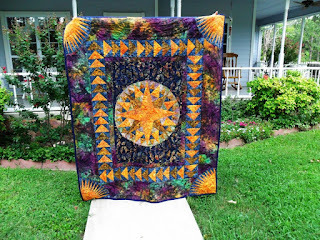 A few months later, when my ALS husband needed Hospice, the same hospice refused to give me the same staff I was so happy with. I felt betrayed. Now I wish I had had death in my own family before I did my own hospice work...the depth of grief just cannot be explained if you have not been through it...xo to you. I am so sorry for your loss but so very glad you were able to help your family navigate those deep waters. Since I have been living with and caring for my 96 year old father for the last 2 years, I know there is so much I need to learn since we are determined he will stay home! You know so much more about what goes on right before and after then the rest of us. Thank you for sharing the links with us. Kat, I'm so sorry for your loss. Thank you for a very important post. Thanks for sharing. Sorry for your loss. My mother died at her home nine months after being diagnosed with ALS. She declined all mechanical means of life support. No feeding tube. We had hospice come to the house. When she died, I and her two granddaughters were present with her. It was how she wanted it to be. What helped me in this dying process was, that her doctor gave us papers to explain what the process was. Of how the body is as the stages of death happens. It was a comfort to know. I respected my mother's wishes. She never wanted the hospital and all that. She wanted a natural death. I'm sorry for your loss. Thank you for sharing this information. Thank you for sharing your experience with us - for the joy that can come with being there for family, but also for the hardship of having to make decisions that we're often not ready for. We were able to "nurse" my mother in her last days, at home, with her husband there, and all of her children providing for her care - it's a privilege that was hard, but still was a blessing to us, and to my dad. Thank you for the links. 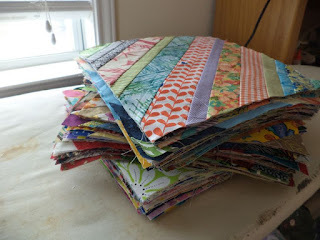 Thanks for the quilty goodness too! I am sorry for the loss of a loved one. I know having you there must have been such a comfort. Thank you for this well written post and your sage advice.